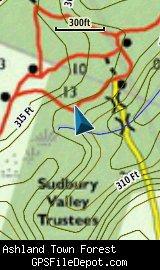 Also known as the Cowassock Woods, this area includes property owned by the town of Ashland and the Sudbury Valley Trustees. 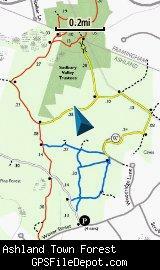 The Bay Circuit Trail runs through the heart of the Ashland Town Forest. 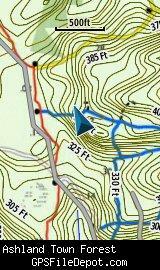 The images below are all from a Garmin GPSMAP 78sc. The first image is with no other maps displayed. 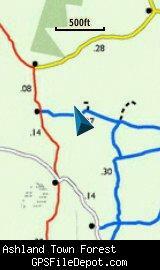 The next two rows have an image on the left with no other map displayed while the image on the right has the Garmin 24K NE series TOPO maps displayed. Fixed a zip file error. Changed draw order to 32. 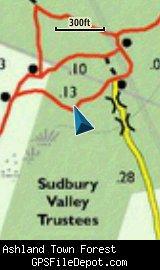 Initial release using undated map downloaded from Sudbury Valley Trustees website (see above) on Jan 2, 2012.